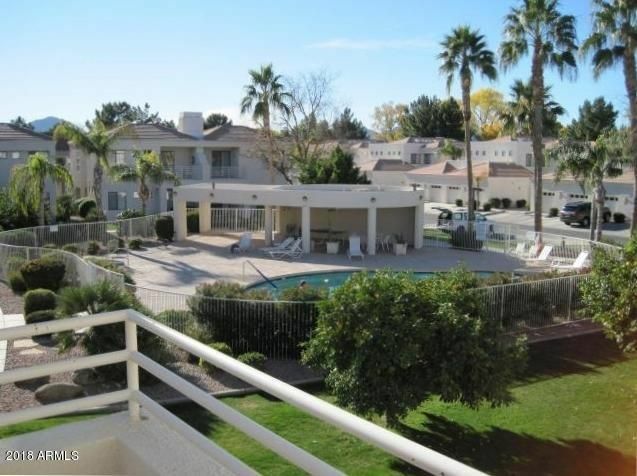 Prime 2nd floor condo overlooking community pool with view of Camelback Mountain in heart of McCormick Ranch. Large master bedroom and bath with oversized jetted tub, double sink & large walk in closet. Bright 2nd bedroom, plus an office/den that easily handles a queen sofa sleeper to become 3rd bedroom if desired. Light and airy living spaces with plantation shutters throughout. High grade comfy carpet in living and bedrooms, Wood look tile floor in dining and kitchen areas. Highly desired and gated Palm Cove community is on Lake Marguerite in the heart of McCormick Ranch and is conveniently located on the 20+ mile Scottsdale hiking and biking trails.